Our AICPA certificate achievers aim high. They are thought leaders, industry evangelists, strategists and more. They strive to stay ahead of the curve by building their knowledge, broadening their thinking and expanding their skillsets. To them, learning isn’t a task; it’s a fast track to distinguishing themselves among their peers and colleagues. 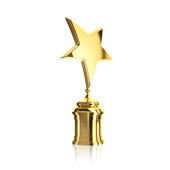 At AICPA, we think our certificate achievers deserve to be recognized. That’s why we created our AICPA Certificate Wall of Fame and our Star Spotlight, which showcase members who have successfully completed any one of our 28 certificate programs. What drove them to push a little harder to learn a lot more? How did they balance their workloads and personal lives with their educational pursuits? And what was the payoff? 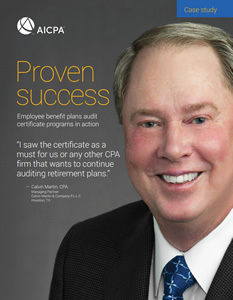 Read on to find out more about it—and how you can bring your own AICPA certificate achievements to light. "The increasing use of blockchain technology in organizations made me want to understand its wide application in all work streams, not just cryptocurrency. I also wanted to be prepared in the event my employer chooses to implement the same." "As the CPA profession becomes more analytic and data-driven, I believe the corporate accounting group of the future will be 50% accountants, 25% data scientists and 25% programmers. So, when I saw the Data-Driven Leadership Program was being offered, I knew it was right up my alley." Whether teaching his grandchildren to catch a baseball or conveying what he’s learned as a public accountant to those just starting out, Frank Jakosz says the personal satisfaction of sharing knowledge is the best reward. That’s also why he is a founding member of the AICPA Not-For-Profit (NFP) Advisory Council, created to support others working in the NFP sector. As part of his own continuing education, Frank participated in the AICPA NFP Certificate Program, which covers the unique and fast-changing financial needs of NFP entities. Here, he shares his thoughts on the benefits of the program and the role professional development takes in a life-long learning path. You not only just added a wealth of knowledge and enhanced your skillsets, but also you just broadened your thinking, which will help you stay ahead of the curve. By upskilling, you have already demonstrated your determination and willing ness to learn, as well as taking the right step in future-proofing your career. Your hard work and commitment certainly shine. Congratulations on your accomplishments! Cal Poly SLO University & Pacific Coast Transportation, Inc.
President, Kaczynski & Associates, Ltd.
By completing one of our certificates, you are already qualified to be featured on this page. All you need to do is fill out our Wall of Fame submission form and you will have a chance to shine among our stars. It only takes a few minutes. Digital blockchain based assets have emerged as the first censorship resistant form of storing value. The Internet of Money is here and it changes everything. The Blockchain Fundamentals Certificate helped me stay ahead of the curve and prepared for the revolution, as it will change accounting, as well as the needs of my clients, forever." I took this course because of the rising impact on our profession and particularly our clients. I like to be prepared to assist our clients in understanding changes in accounting and financial reporting as they arise. With blockchain, our clients need to be updated on changing technology for smart contracts, for permissioned blockchain applications and all the related technological advances that could improve their profitability and efficiency." Every CPA who wishes to be technologically competent needs a fundamental grounding in this game changing technology. Only a matter of time before Blockchain becomes part core body of knowledge for new entrants to the profession." I am currently in the middle of the certification process and am so glad I began. A lover of learning, I find myself building on my existing knowledge of non-profit accounting management. This certification will set me apart from my peers. I look forward to finishing the program and obtaining the certificate." I'm new to nonprofits after having spent my entire career on the for-profit side. This course strikes a good balance between providing an introduction but also a decent depth of coverage. The material is thorough and in depth but since it is self-paced, allows the student to skip the parts that are known and to concentrate on the new learning points. The materials are an enjoyable mix of audio, text, and interactive pieces that hold your interest. The tests at the end of each module cement the learning. Nicely done! Meet Cheryl. After years of experience as a large- firm auditor, she changed her career trajectory by joining a nonprofit. That meant expanding her skill set with the AICPA Not-for-Profit Certificates. The result? She stays current on all aspects of NFP accounting. She advises fellow NFPs on financial matters. And that’s just the beginning.